Always up for good counterpoint, we jumped from Zion to Las Vegas, where the scenery changed from sheer rocky cliffs to towering hotels, from river to fountains, from nighttime sky to neon flashing lights. Adjusting to the extreme heat and general sensory overload, we checked into the Hotel Monte Carlo, which turned out to be cheaper in cost than our digs in Sedona. From there, we threw on our “nice” clothes and set out on the strip for the long walk through what seemed like miles of hotel lobbies, casino rooms, high-end malls, and finally landed at The Venetian for dinner. Good food is super easy to find in Vegas (among other things). Reasonably-priced good food is tougher... so we landed at Bouchon, which is somewhere in the middle of the price range but at the top of the quality range. (The chef, Thomas Keller, has been named “America’s Best Chef” by Time Magazine.) With classic french bistro decor, a relaxed ambiance, and some jedi mind tricks that made us feel like we were on the ground floor (rather than the actual 10th floor), we sank into our table eager to have something other than camp cooking. 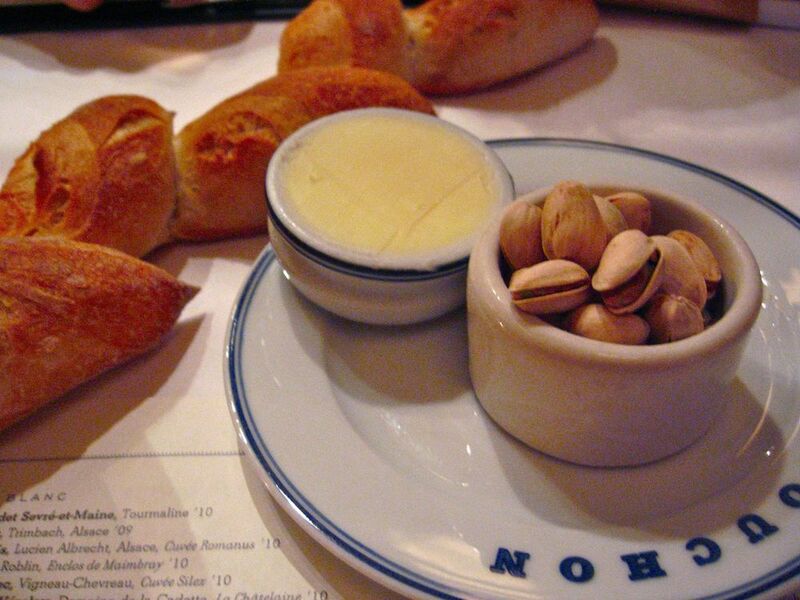 We devoured the warm-up course: bread and pistachios with some of the best butter we’d ever tried. For a main course, Loren opted for the Sole Marinière (sautéed fillet of sole, caramelized baby artichokes, manila clams, oyster mushrooms, coco beans, and a delicious seafood broth). For Kristen, the Veal Chateaubriand (seared veal loin, crispy polenta, jingle bell peppers, glazed figs, fennel bulb & sauce soubise). It was really hard to peel us out of our happy-belly stupor, especially knowing that we definitely had to make our way, in the heat, all the way back down to the Monte Carlo. Turns out Vegas at night trumps Vegas by day. While it was still super hot, and while there were tons of people still out on the streets, things seemed marginally less hectic. And at least we had the neon lights to keep our focus from the heat! 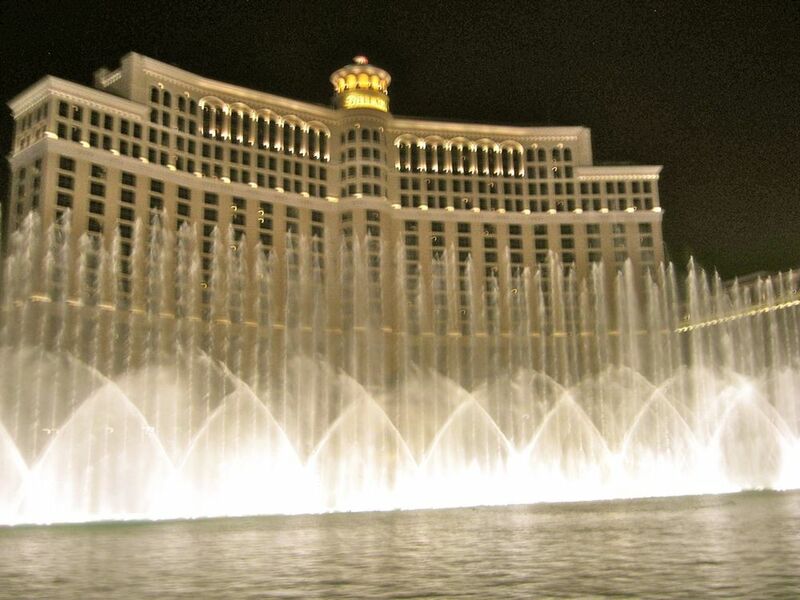 After leaving the Eiffel Tower bar, we made it just in time to catch another showing of the Bellagio Fountain show, which was a bit overshadowed by the terrible choice in music ("God Bless the USA"... why didn't Bellagio stick with Clair de Lune, like in Ocean's Eleven?) but still worth seeing. Our next stop was a spot close to our own hotel, the Cosmopolitan's Chandelier bar, where we topped off our liquor buzz with another drink each, though the ambiance far outweighed the drinks this time. After that liquid confidence, we made it back to the Monte Carlo where we decided to try our luck in the casino. First stop: slots. We each lost one dollar immediately, expecting it'd last for at least a few "spins". That sucked. Kristen swore off gambling, Loren tried Fast Roulette and digital Blackjack, and both turned in fairly early by Vegas standards. Total money lost at casino: $25. All in all, we spent our money where we wanted to: on food and drink. Dinner was literally more expensive than our hotel room for the night. 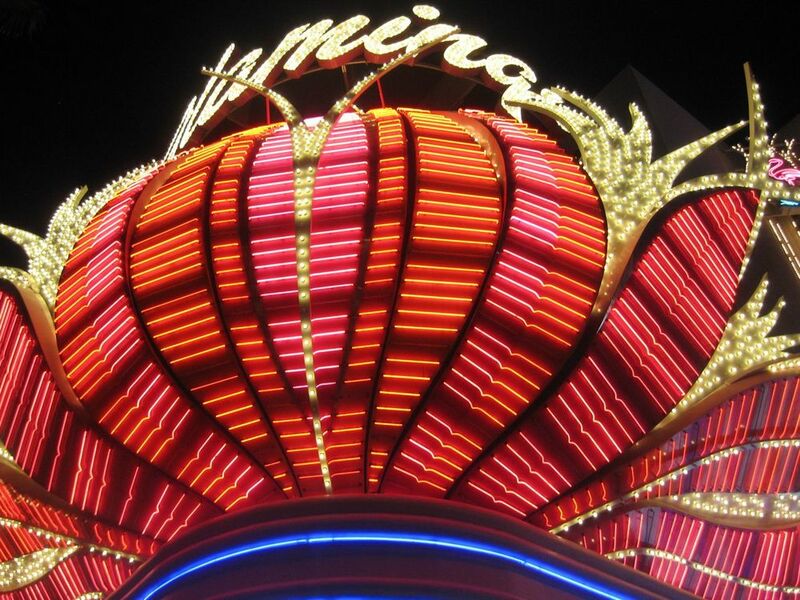 Vegas is certainly a spectacle, and we'll be back at some point at least to try more restaurants, to catch a Cirque du Soleil performance, and to visit the currently-under-renovation but soon-to-reopen Neon Graveyard in North vegas. Until then, we'll save up.